When a Boston landscape architect was hired to landscape the park, a lake was designed as the centerpiece. 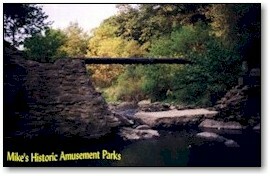 The lake was constructed using the Big Run Creek which already flowed through the park and a dam was constructed to contain the lake. Through the years, the lake filled in with silt and by the 1950s, the lake had transformed into a swamp. 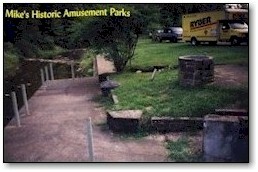 By the mid 50s, the lake was restored, redicated, and again provided boating, fishing, and swimming. The Lake has again filled, and now looks like a forest. In the 1980s the original dam finally broke and let what was left of the lake completely run dry. In 1997, rumors circulated that the lake might again be restored but that has proven itself to be just a rumor. 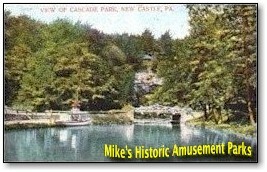 The lake could be a great attraction to keep people coming to Cascade Park and New Castle. An excellent place to have 4th of July fireworks again! These two photos were taken from the same spot. 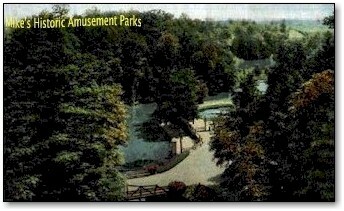 A nice view of the boat dock area, and the lake (background) circa 1912.